Real operating data offer immense potential for improving drive trains’ rolling bearing supports and the system as a whole, as well as for optimizing wind turbine operation. Evaluating and interpreting the gathered data makes it possible to more accurately define safety factors and adapt them for new developments, for example. In collaboration with pilot customers, Schaeffler is also developing sensor concepts for recording variables that influence bearing damage and have previously not been monitored. 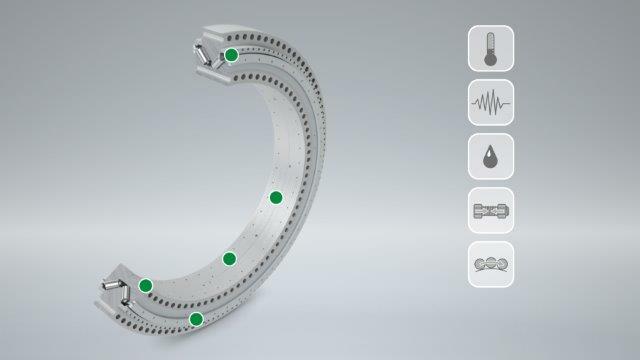 In the case of Schaeffler’s flanged rotor bearing, for example, the sensor combination used comprises established temperature and vibration sensors together with the Schaeffler GreaseCheck grease sensor, the new Schaeffler LoadSense Pin, and an equally new roller set sliding distance sensor. The Schaeffler GreaseCheck is an optical sensor system that allows changes in the condition of the grease to be detected early. The sensor head is just 5 mm wide and records three parameters: Turbidity, water content, and grease temperature. Customers can classify the condition of the grease during operation as good or bad by setting individual threshold values for turbidity and water content. A particular benefit is that wind farm operators can use the Schaeffler GreaseCheck to determine relubrication intervals for new turbines without having to go through the costly process of taking and analyzing grease samples. Because the condition of the grease is continuously monitored, operators can respond by initiating maintenance measures when changes are detected, in some cases even before bearing damage occurs. If a sufficient number of turbines are installed, the relubrication intervals can be scheduled based on requirements and the maintenance outlay reduced even further in the medium term. In the case of pre-assembled rotor bearing systems that are flange-mounted to the adjacent construction, the preload of the screw connections that are used partially determines the bearing’s load distribution and thus has a direct effect on its performance capability and operating life. To monitor this screw preload, Schaeffler has developed the LoadSense Pin, a new sensor based on the company’s Sensotect thin-layer sensor technology, and uses the measurement method employed by strain gauges. The LoadSense Pin’s sensor coating is applied directly to the end face and (for temperature compensation) the outside surface of a small steel cylinder. The sensor is pressed into a bore for which it is slightly oversized on the component on which measurements are to be made, and thus experiences the same expansion as the material that surrounds it. This means that, unlike conventional adhesive strain gauges, the LoadSense Pin is integrated directly into the bearing ring. Schaeffler’s LoadSense Pin allows the preload of the flanged bearing’s screw connections to be monitored during operation, which means that the screws can be tightened as required and eliminates the need for preload inspection at fixed intervals. 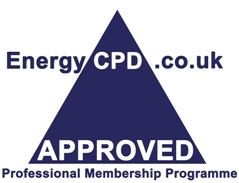 This increases the reliability of the bearing system and reduces the maintenance costs at the same time. This inductive sensor records the number of times that a rolling element passes the sensor head during a fixed number of rotor shaft rotations. The rolling motion of the contact partners in the bearing always means sliding movements – which are small when the design is correct. This micro-slippage between the driven bearing ring and the rolling element set changes the circumferential speed of the rolling element set and thus the frequency with which the rolling elements pass the sensor head. When the inner geometry of the rolling bearing is known, the mean sliding distance and micro-slippage can be very accurately calculated as an average over time from the number of rolling element passes – even when the rotor speed fluctuates – which allows various load, friction, and lubrication conditions to be deduced. This measurement is simple, extremely reliable, and allows conclusions to be made about operating conditions (including kinematics) in the rolling bearing. Collaborating with Schaeffler on these development projects gives pilot customers the opportunity to determine the critical influencing variables for their rotor bearing supports based on the measurement data that are recorded. Aside from the mid-term objective of enabling defined damage mechanisms in rotor bearings to be predicted, this combination of sensors already makes it possible to detect several unfavorable operating conditions in the bearing and, using an adapted maintenance and operating strategy, prevent these or initiate countermeasures at an early stage. Unfavorable conditions for the bearing that can be rectified by relubrication, for example, are also detected before bearing damage begins to occur. In this way, the rotor bearings’ operating life can be increased and their operating costs reduced just a short time after installation. IBC SOLAR AG and its Moroccan partner company SEWT sarl have delivered and installed an off-grid PV hybrid system with a capacity of 126 kW ordered by the National Moroccan Fishery Office. The system consists of 500 photovoltaic panels combined with batteries and diesel generators and is located in Aftissat, a fisher’s village in the province of Boujdour (Southern Morocco). The innovative 28 MW offshore wind power project located in the waters of North-western Denmark is fully operational, producing power for customers Nissum Bredning Vindmøllelaug and Jysk Energi since early 2018. Utilizing the first serial-manufactured SWT-7.0-154 direct drive offshore wind turbines, the project is a showcase of Siemens Gamesa’s commitment to innovation and reducing costs. The turbines and further technological advancements have fulfilled expectations and are now in preparation to become available for commercial deployment.